Ed. note: CBS Sacramento did this segment on the essential role Concerns of Police Survivors (COPS) plays in helping family and friends cope with the trauma when a law enforcement officer is killed in the line of duty. For over three decades, COPS has been doing incredible work and providing an important service. PLACER COUNTY (CBS13) — You’re about to get a glimpse into a world you’ve probably never seen. Every day, the men and women of law enforcement get up, get dressed and leave their families to protect ours. But when they don’t return home, when their lives are taken in the line of duty, a group of people you’ve probably never even heard of is there to help. The images are difficult to see, the sounds are chilling, but few can imagine the pain felt by loved ones and the law enforcement family of fallen officers. It’s been a trying 16 months for Placer County Sheriff Ed Bonner, who is coping with losing one of his own. On Oct. 24, 2014, Placer County Sheriff’s Det. Michael Davis and Sacramento County Sheriff’s deputy Danny Oliver were killed as part of a two-county crime spree. Prosecutors say on that day, Luis Enrique Monroy Bracamontes shot and and killed Oliver as the deputy checked on a suspicious vehicle report outside a Motel 6 in Sacramento County. From there, he took off and stopped in Placer County, where Davis and another deputy found and approached the car. Both were shot, Davis fatally. Bonner was off that day watching Game 3 of the World Series between the San Francisco Giants and the Kansas City Royals when he got the call. “The undersheriff called and said ‘bad,’ so I got in my car and drove back, and it was funny because people go ‘Oh I bet you drove fast.’ No, I drove the speed limit, I knew where I was going and I didn’t want to get there,” he said. He made his way back to Placer County, met with Davis’ family and then joined his law enforcement family for a briefing—one of the toughest things he says he’s ever done. “I’m the dad. This was my son that was murdered, my brother that was murdered, and boy was that hard,” he said. Little did he know, in that crowded room was a stranger there to help. It was someone who knew firsthand the pain of loving a loved one in the line of duty. Susan Moody lost her husband, Brad, in a deadly accident in 2008. He was a police officer on duty in Richmond and responding to a call when he lost control of his car and slammed sideways into a lightpole. Susan rushed to the hospital. It was love at first sight for Susan and Brad. She knew from the moment her brother introduced them that he was the one. “We talked, I got in the car, called my brother, and said ‘I will marry him. I will be his wife,’” she said. That was October of 2001. They started dating the following summer and then were married. “He was my prince and everything was so easy and happy and it was just a perfect love story,” she said. The pair had two little girls and enjoyed every moment of being a family. Susan will never forget their last night. Four days later, she was saying her final goodbyes and making decisions about donating her husband’s organs. Thankfully she didn’t have to make it alone. “I didn’t know how I was going to make it through until I met this organization called COPS,” she said. 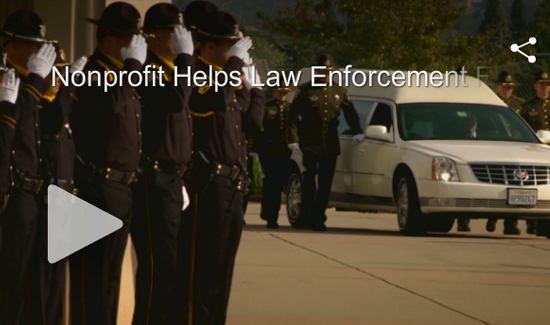 Concerns Of Police Survivors is a nonprofit that provides resources for families of fallen police officers. Its mission is to help repair shattered lives. “They told me they can’t replace him, they can’t bring him back, but they were there to let me know that I wasn’t going to go through this alone,” she said. Every year in the United States, between 140 and 160 officers are killed in the line of duty. There’s no membership fee for COPS, because the people who join the group have already paid the ultimate price. “It’s an organization that is there to help families and officers and departments who are going through the worst tragedy to know they don’t have to go through it alone,” she said. The group began in 1984 with just 110 members, and now has more than 15,000 people. Susan Moody is now the president of the Northern California chapter of COPS. She was the stranger in the room on that unthinkable October day in Placer County. The people of COPS come in and help pick up the pieces after going through the same tragic events themselves. “For somebody to say I need to go to the next thing, I need to go to the next person, the next agency, willingly do that and share their story, their tragedy—how amazing are these people?” Bonner said. As president, Susan is immersed in paperwork and planning major events, like their Black and Blue Ball in January—their biggest fundraiser yet. It also means leaving when tragedy strikes to be with those who need her the most. She says it’s been cathartic and a way to give back. “A lot of people ask me, ‘Isn’t it hard for you to keep going into families and departments? Doesn’t it bring back your emotions from losing your husband?’ Well, sure, of course it does; how could it not? But, if I can put myself thru that to help somebody I’d do it for the rest of my life if I could,” she said. She and her girls are taking their grieving process day-by-day and year-by-year, healing together, making new memories and keeping the old memories of Brad alive in their home with pictures and memorabilia, keeping his love in their hearts. And with Susan’s help and the help of COPS, the community and their commitment to deputy Davis and each other, the Placer County Sheriff’s Department has made it through the last 16 months, and they sheriff says they’ve grown stronger. “I think we’re—I don’t want to say better because we’re not. We’ve lost Michael—but I do think we’re stronger better prepared and more committed to the community because of the way they rallied around us. it was phenomenal,” Bonner said. He says it’s a lesson for other departments as well.